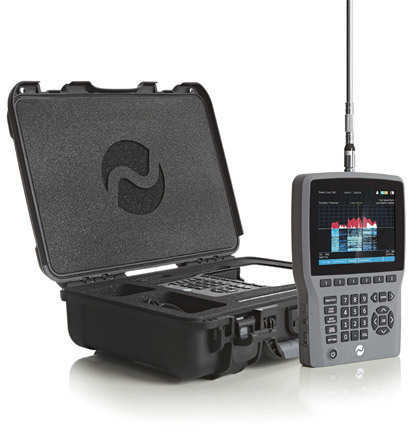 The IPS-SA3 is a fully integrated portable RF Spectrum Analyser designed specifically for professional countermeasures use (TSCM). 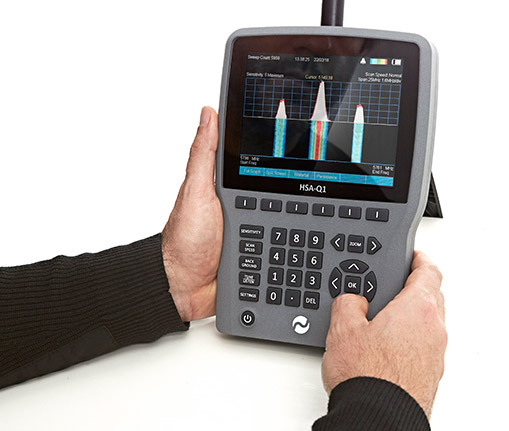 It has been designed with the highest possible technical specification to ensure maximum detection capability and has a range of invaluable features to aid countermeasures RF detection or ‘Sweeps’. Despite its technical capability the IPS-S3 remains easy to operate with an intuitive user friendly interface. 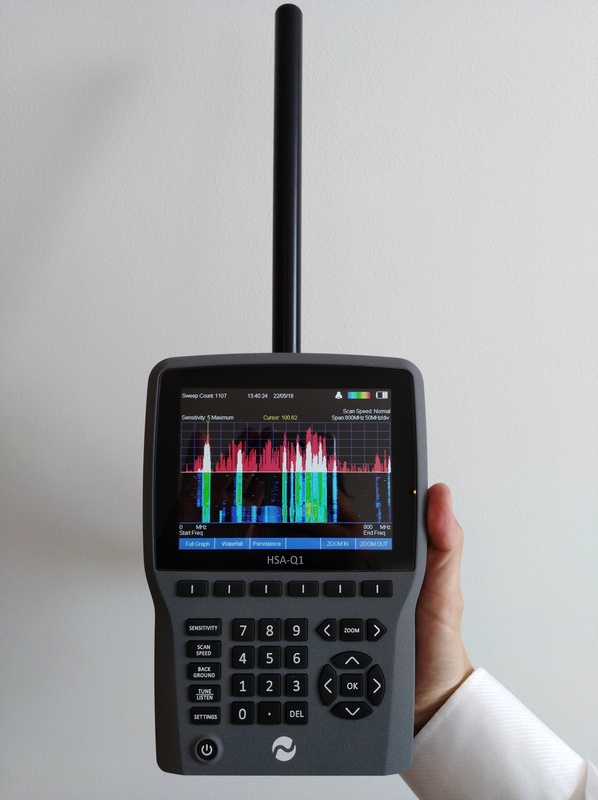 The IPS-SA3 features a Tune-Listen function where at the press of a button the user can direct tune into any signal detected, view the signal pattern and see the signal strength live (down to -100dBm). If required the user can also select Wide FM, Narrow FM or AM demodulation and listen to the detected signal through the built in loudspeaker or earphones. This can be especially useful in identifying conventional bugs with microphones or eliminating other innocent detected signals such as broadcast radio. If required the IPS-SA3 can perform a ‘Background’ scan where it will learn and store the current RF environment. This can be stored and recalled at any time in the future for comparison to see if any new suspect signals have appeared in the RF environment since last checked. New signals will be highlighted on the display for closer inspection. WATERFALL FUNCTION & PERSISTANCE DISPLAY Detect Cellular, Wifi, Burst and GPS based devices. For maximum flexibility the IPS-SA3 is supplied with two antennae: a Multi-Element Antenna for general use and a telescopic whip antenna for low frequency use. 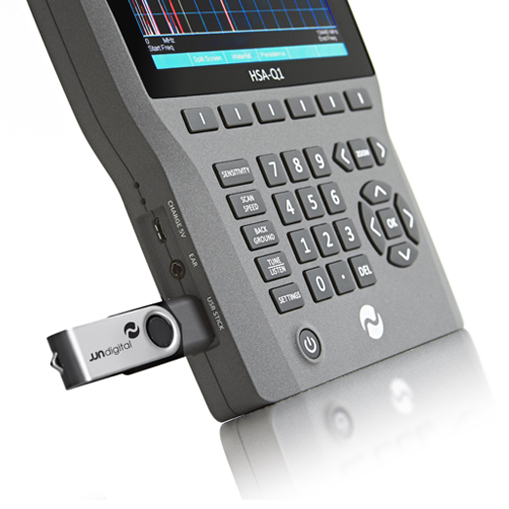 The IPS-SA3 is genuinely portable for handheld use and is also fitted with a retractable stand for desktop use. The unit weighs just 1.3 Kg and is encased in a machined aluminium enclosure for ultimate durability. The internal Lithium Polymer battery pack gives 4 hours of use from one charge. The unit can also be operated continuously with the supplied charger connected. The whole package is supplied in a compact military standard carry case for ultimate protection and portability. The IPS-SA3 is designed, manufactured and tested in England to highest technical standards.